Summer is here in full force. What type of summer have you been experiencing so far? In my experience, there are essentially six types of summers that exist. In this episode of The New Music Industry Podcast, you’ll learn about how these seasonal changes can affect you as an artist. 08:26 – What type of summer have you been experiencing? Thanks for joining me. Normally on the podcast, I would be sharing some insights about marketing, social media, or possibly business and entrepreneurship. But today, I wanted to take a break from that to talk about a different matter entirely. I actually debated whether this was something I should even bring up. But just the other day, I took some time out to go for a walk in Canmore. It’s a rather picturesque town nestled in the Rockies, only about an hour or an hour and a half away from where I live in Calgary. It’s a beautiful town. It’s also a bit of a tourist destination. The thing that occurred to me – and I’ve had a lot of conversations with some entrepreneurs and artists I know – they seem to be experiencing this summer in a rather disruptive way. There are some exceptions of course – I’ve also talked to some people that really seem to be loving it and in their element, which is great. But as artists, we will go through different seasons. This is also the type of content that I’ve been creating for my upcoming book, Flashes of Elation. So even if I just spend one episode talking about this, I believe it is something that could be of value to you. 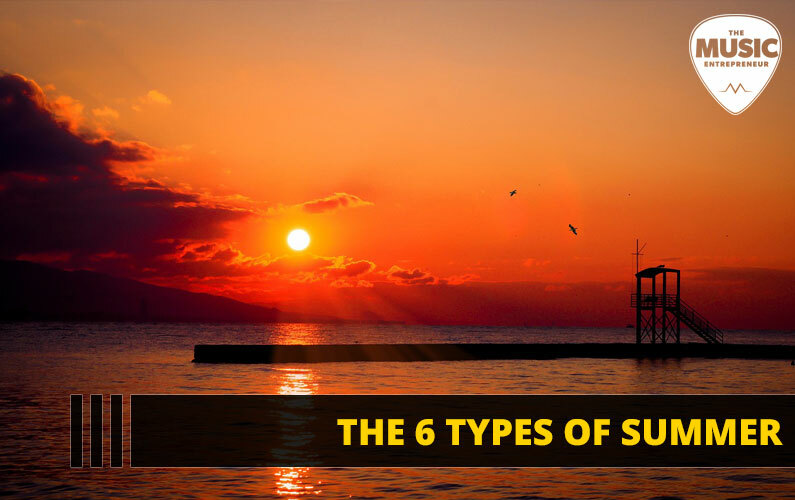 So, we will get back to the regularly scheduled program in the next few episodes, but for this one I wanted to talk about the six types of summer and how to interpret them. How we look at events shapes our lives. That’s how significant this whole issue of interpretation is to me. I think you will also find that you can view life’s events through different lenses. Sometimes that can come through experience and time and some of the healing that you’ll experience along the way. I believe there have been a lot of shifts. It’s not only on a global scale with some of the things that are happening in politics and across the world. And of course, on a more localized, personal level as I see reflected through some of the people that I know personally. These sudden and disruptive shifts can affect you and your ability to move forward in your career, or finish the tasks you need to complete, or take your relationships to the next level, or really just slow down and enjoy life. There is a rhythm to life from week to week, and also from season to season. I have often ignored this, especially in the last six years or so, because I’ve been pursuing various ventures and endeavors as an entrepreneur and as a musician. So often we judge the heart and try to push it down and forget about it. Then, we wake up days later or weeks later or months or years later to realize we have unfulfilled desires. As I was going on a walk in Canmore and reflecting on my past experiences, I basically identified six types of summers that exist. There could be others too. I would love to hear your thoughts on that. But I’ve used words that start with the letter “R” to maintain uniformity. So, all the following types of summer begin with the letter “R”. The first type of summer is the summer of relief. This is really one of my favorites. You get to breathe, and spread your wings, and maybe even take a break. It may even feel like an oasis in the middle of a dessert based on all the hardships that you’ve experienced earlier in the year, or some of the assignments that you’ve had to plow through, or whatever difficulties you’ve been experiencing in life. There really isn’t a whole lot to interpret with regards to the summer of relief. Chances are you’ve been in touch with your heart and been following with the seasons for a while. The second type of summer that I’ve encountered is one of recreation. This is where you get to go out, have fun, maybe go to a lake and go boating, or fishing, or swimming. There’s a lot of activity – not necessarily one after the other, but there is enough to keep you engaged and interested. You get to do things you don’t usually get to do. Maybe you’ll pick up a good book and read, do some journaling, meet new people, share new experiences with your friends and family members. The summer of recreation is really great because you get to recreate yourself. You get to recreate your energy. The third type of summer is the summer of restoration. You get to heal from old wounds and possibly even purge old beliefs. But the main thing to remember here is that healing can be painful. Anybody who’s been through rehab will probably tell you that even though the moment of injury was the most traumatic and painful, the months or possibly even years spent recovering were just as difficult in some ways. But if you’re going through the summer of restoration, overall it can be a great thing because you get to reclaim things from your past that you’ve lost, which might even be a piece of yourself. The fourth type of summer is the summer of restlessness, which is the most painful to talk about and really my least favorite. You have those feelings of not being sure about your life, or what to even do with yourself. You’re watching the clock as it ticks by the seconds, wondering when this minute will be over. You don’t know what to do or where to go. Even when you are out doing things that are supposed to be fun, you’re still not fully satisfied in that moment. There are a lot of categories to think about in terms of uncertainty. Uncertainty is really at the root of the restlessness you’re experiencing. It could be because of relationships, projects that you haven’t finished, income, or debts, or a job, or even a career. I think a major category – and I’m seeing this a lot right now – is summer love, infatuation, love sickness, unrequited love. I even put together a video about that so I’ll make sure to include that in the show notes [note: this video is no longer available]. The fifth type of summer is the summer of relocation, which can be a great thing, but can also be immensely uncomfortable. You probably have some kind of itinerary or schedule for your summer. You know where you’re going to be and it’s all mapped out, almost like a band that’s on tour. Relocation almost always means moving from one familiar place to a less comfortable one. Whether that’s physical, mental, spiritual, emotional or even financial. I think it’s helpful to remember that this is all part of your growth process. It could even be argued that everything you encounter in life offers a growth experience. When you relocate, everything is new and fresh and different. The new experiences that come into your life may be uncomfortable for a while, but you’ll learn to accept and live with them. The sixth and final type of summer I’ve identified as part of being my experiences is summer of realization. Again, realization isn’t necessarily a bad thing. You may be waking up to certain realities you hadn’t really considered before. It could be that you haven’t accomplished what you thought you would have accomplished by now. It could be that you’ve come to the realization you only have so many years to live, and you want to begin allocating your time differently than you have to this point. Sometimes this can all manifest as a rude awakening, which certainly makes your summer uncomfortable. It’s only natural that with the passage of time you’re going to begin reflecting on past experiences and thinking about where you’ve come and how you got there. We all do that at different times of the year. I feel like the New Year is often the best time to do that, but summer can also offer that opportunity for us to think about and reflect on what’s happened. I think it’s all just part of the natural rhythm of the seasons. What type of summer are you experiencing? At this point you’ve probably identified what summer you’ve been experiencing so far. You’ve probably also thought about the six different types of summer and which one you would rather be experiencing than the one you are right now. Maybe not so much if you’re experiencing a summer of relief, recreation, or restoration. But the less comfortable ones are often restlessness, relocation and realization. But I do have some good news for you if you are going through the summer of restlessness, relocation, or realization. That is simply this: The different types of summer can overlap. Even though you might be going through a bit of a rude awakening at this very moment, on the other side it could be relief, or restoration, or recreation. Earlier in life it seems like summers seem to carry on a single theme, but as you advance in years, there’s just way more overlap and intersection than there perhaps was in the past. Whatever you may be going through right this moment, I just want to remind you that the summer is a very special time of the year. You can ignore it, you can loathe or hate it. You can dismiss it. But I believe it’s wise to acknowledge and go with the rhythm of life. You will only experience so many summers in your lifetime. If you happen to be living in a more temperate climate, you may not be able to appreciate this quite in the level that I do here in Canada, where the winters can be quite brutal. But summer can be a very special season for all of us. I just want to remind you to take some time to enjoy it. No matter what you might be going through right now, don’t worry. There’s probably something waiting for you on the other side.